Last week I posted an analysis of the important characteristics of avatar names. The post proved so popular that I decided to build a tool with which you can calculate a score for your name's coolness! After some experimentation with scripts, I believe I now have an easy-to-use tool ready for use here. It's quite straightforward: just answer the questions below, hit the "Score Me!" button at the bottom and your name's rating will be automatically calculated. The maximum score is 100. How does the scoring system work, you ask? I devised scores for all the characteristics based on how I feel about them. Again, like the characteristics, it's my own opinion; yours may differ. I've added a category for Gender, as correctly pointed out by Vint Falken's comment on the previous post. Please give the scoring system a try and add your score to the comments; I'd like to see how your name ranks. Mine is only 56. Does name include any digits? Does first name "flow" into last name? Can name be easily abbreviated to 2-4 characters? Does meaning of first name match or complement last name? Mine isn’t. Let’s get that straight right from the top. But yours might be, and let’s find out. I’ve done a lot of thinking about names, having subjected myself to such a terrible name. If I could do it all over, I’d consider the following characteristics when selecting a new name. No matter how beautiful a name might be, if it’s too long it is difficult for others to type. Names should be no more than ten characters, and preferably less. Some names are simply difficult to spell, regardless of length. I’m not sure why, but I suspect it must have something to do with the similarity of the name to common words or whether the spelling matches the pronunciation. You can spell it, you can type it. But can you say it? Is the correct pronunciation obvious, or are there multiple possible pronunciations? Will you remember the avatar’s name tomorrow? Was it something that caught your attention, or was it a generic name that is easily lost in your memory? Look, if you have digits hanging from the tail-end of your name you obviously just moved over from AOL, right? A definite no-no. Unfortunately you cannot adjust the case of your name after its registered. Some have capitalized the first letter, some have not. Some used mixed case, and a few use caps ALL THE WAY THROUGH. I prefer first-letter capitalization or mixed case. However, I must say one friend who uses an ALL CAPS name is very easy to locate in busy chat logs. The rhythm is the audible fit of the first name and the last name. One theory of naming says you should combine single syllable names with multiple syllable names. They just sound better when you say them. Often this means ending the first name with a vowel and beginning the last name with a consonant, or vice versa. Can the name be quickly abbreviated for use in chats in a way that it is still unique? What 3-5 characters can be readily identified as the avatar’s name? Linden Lab has done a paramount job selecting unusual and interesting last names. Our job is to select a first name that somehow matches the semantic qualities of the last name. Did you know there are 1546 people with the name "Aaron"? It can be confusing if your circle of friends have people with identical first names: "AaronB", "AaronP", etc. A good name would be completely unique, with no possibility of confusion with others. You may disagree with these factors, as they are only my personal opinion. Perhaps we can make name analysis more interesting? Next week I will try to post a scoring system that you can use to check your own name against these factors. There’s one aspect of running a business that is often forgotten, and I fear it is totally neglected by almost all Second Life businesses: What happens when you can’t continue? What do I mean by “can’t continue”? I mean this: you are sick, permanently disconnected, injured, imprisoned, kidnapped, dead or otherwise completely unable to do any work whatsoever on your virtual business. In RL this is called “Succession Planning”. The idea is that you assume you’re gonna eventually disappear for some reason, and we’d better figure out who’s taking over when you do. Large businesses take great care in laying out detailed succession plans, so that when the execs go down in a fiery airplane crash, everyone knows what to do. Even small businesses take time to consider what needs to happen, if they are well run. The issues are no different in SL, except in scale. However, I suspect very few in-world businesses have considered this possibility. 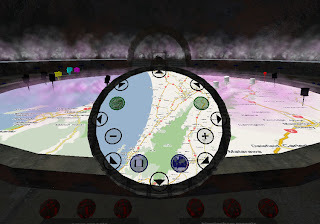 And even worse, a virtual environment poses additional difficulties well beyond those encountered in RL business disasters: anonymity. Fees requiring manual intervention remain unpaid, since you aren’t there, remember? A tragedy for certain; not only for the maker, but also for residents because the maker’s wonderful items would no longer be available. Would you bother doing this? I would consider this type of plan necessary only if you have a significant in-world business, either one with lots of revenue or one where many people depend on your operation. Many smaller virtual businesses are barely viable and probably are not worth these steps. Let’s hope you survive a long time. Note that I don’t say, “let’s hope nothing bad happens”, because something bad Will Indeed Happen Eventually. Plan on it. I examined an interesting social theory the other day: Dunbar's Number. The short explanation is that it's 150. Oh, you want more? What the heck does that mean? 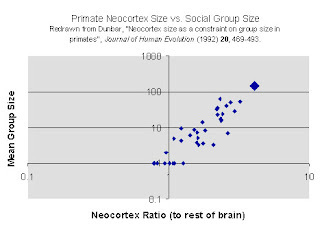 Quite simply, your brain can't keep track of more than 150 individuals in any effective way. It's not a matter of practice or experience. It's biology and neural logistics! Multiple evidence has arisen to confirm this theory, including the typical sizes of villages, military units, etc. The theory goes on to suggest that you cannot maintain 150 relationships unless you spend almost half your available time engaging with them. In certain social situations, this can be accomplished and is sometimes necessary (e.g. military), but in common experience, we simply don't have the time to perform the necessary engagement to maintain all of the relationships. In other words, practical experience indicates that 150 is not achievable. I've read that a more pragmatic number is around 75 individuals for casual environments like Second Life. So what does this have to do with the Second Life experience? The other day I was searching for one of my friends and began scrolling down my Friend List. And it was a very, very long scroll. My gosh, how many friends do I have, anyway? A quick count revealed approximately 134 avatars on my list. Wait a minute! That's way over the practical Dunbar limit! How big is your friends list? Do trim or clean it periodically? How far over or under Dunbar's number are you? Drop a comment with your view! Normally I try to post items that are instructive, amusing, profound or heartbreaking. Instead, I offer gentle readers a report on my experience at this past weekend's fundraiser for the Relay for Life. 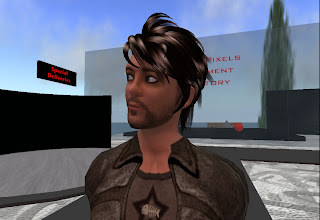 As I had mentioned previously, I placed myself for sale along with notable SL personalities for charity. It's part of the SL Relay for Life event, and some friends were organizing a fundraiser and I thought I should help out. I hope my efforts were worthwhile, although they were far less than the tireless organizers, Shawna Montgomery and Anhalya Lycia, who must have worked 14 hours each on Sunday. Their work paid off, as the team raised in excess of L$140,000 in a single day at last count. So what happened? It seemed that this was the event of the day, as there were hundreds of visitors throughout the day, including some very interesting and notable people. And they were doing some very interesting and notable activities, as you shall see below. Early in the afternoon, for example, we found SL Supermodel Tymmerie Thorne grinding it out with a Kissing Booth customer. Wait a sec - is she supposed to do that with a girl? 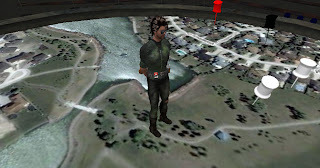 Perhaps the most amusing moment was the arrival of CG Linden, tireless leader of the SL software upgrade release team. I am not kidding: when he entered his assigned Kissing Booth, they all suddenly broke down. Coincidence? Perhaps! I believe Hamlet Au drew perhaps the largest crowd and his witty antics kept everyone nearby in constant ROTFL mode. He's pictured here with Podcaster Nika Dreamscape with fashion photographer Haley Salomon in the background. As he indicated in his post, Hamlet took on all comers, including Vint Falken (who was briefly seen in natural fleshtone color for a few rare moments just before this snap took place!) Some of us thought Vint had sat upon the wrong Kiss Ball, (male), but she indicated that was not the case. BTW, exactly where is your hand going, Vint? 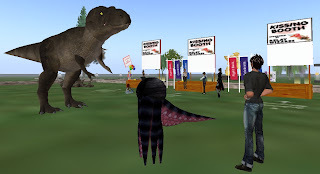 Podcaster Keeme Brown appeared in a shiny new Tyrannosaurus Rex avatar. 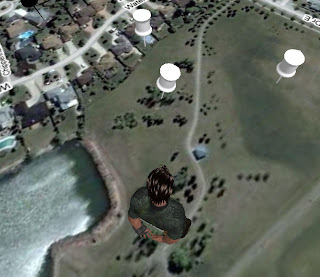 The massive avatar bounded rapidly around the area, often accidentally crushing those caught under his thundering feet (including myself, left in a pool of blood!) Fortunately for the Kissing Booth volunteers, Keeme did not attempt to purchase a kiss. It would have been very messy, indeed. He did attempt to dunk Anhalya Lycia by pressing the release lever with his volkswagen-sized beak, but it didn't trigger. I think Keeme felt the Rex was just a bit too big for the venue, so he comprised by transforming into a knee-high Pillsbury Dough Boy and then disappeared. After a search, I found him hiding underneath Haley Salomon's skirt! Bad, Keeme! Bad! Pictured with Keeme is SS Galaxy Sushi Chef Satu Moreau in what else but an octopus avatar. Several of us pondered the mechanics of kissing an octopus, but as you can see it sort of worked when he latched his suckers onto Tayzia Abbatoir. However, pressin' yo' face into a giant octopus eye is not the most attractive thing to observe. Especially when Satu blinked. Team co-captain and chief engineer for the day Anhayla Lycia had to contend with all manner of emergencies during the event, ranging from missing signs to Wild Animals, such as this Giant Panda. Also on the loose during the day was a ravenous tiger and several smaller creatures. One of the most amazing volunteers was Virtual Aviator and blogger Zoe Connolly. Arriving far before her scheduled time slot and staying well after she was scheduled to leave, Zoe assisted greatly by not only kissing anyone nearby with great vigor, but also by publicizing the event through her personal mega-social network. And that's not all. During her stint in the booth, she had multiple interesting encounters. 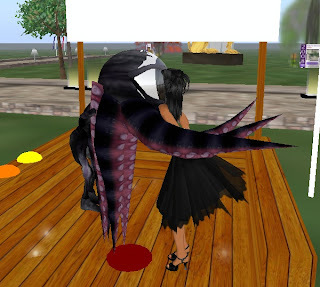 For example, here we see Zoe mixing it up with SL photographer Loki Popinjay. I think Zoe fainted after this one. Yes, the blogging community was very well represented, including four power-bloggers pictured here: Hamlet Au, Vint Falken, Zoe Connolly and myself. Well, at least three power-bloggers, anyway. Sigh. 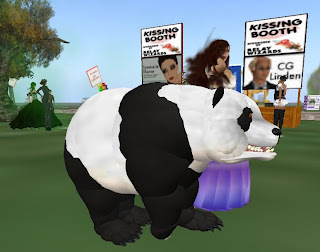 UPDATE 2 June 2008: GoSpeed Racer, who also spent time in a Kissing Booth has another report on the event, with pictures! UPDATE 4 June 2008: Jezabell Barbosa, who spent quite a bit of time at the event, posts even more pictures, including herself with CG Linden.